So the Mountain West Conference broke down and signed the BCS TV deal and we though we would take a look at one of the conferences more interesting mascots for the week. 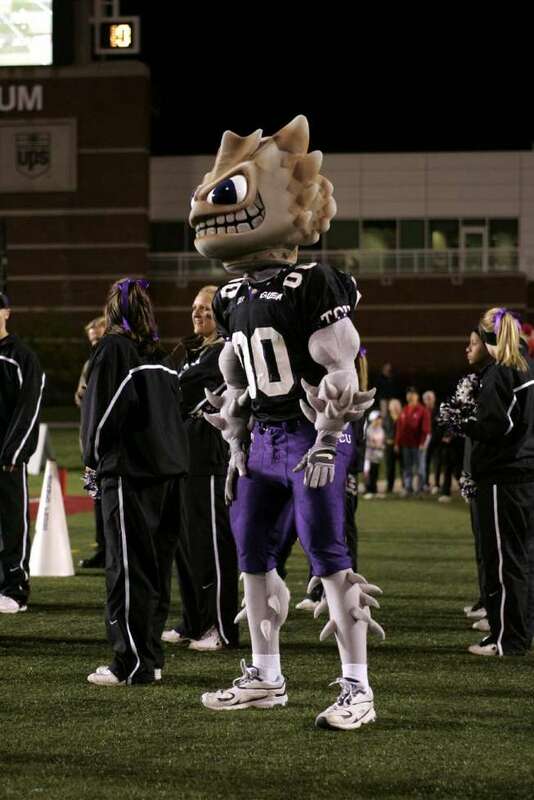 In the unusual tale of the mascot before the school, the Texas Christian University Super Frog became to pillar of strange and unique mascots. Taking many forms and different names, Super Frog continues to poke around the field cheering on the Horned Frog players. We’ll learn some interesting facts about the horned frog and explore just why a school would name themselves after one. So get ready to shoot blood because here’s the Texas Christian Super Frog. Depending on who you talk to, the birth of the Texas Christian University Horned Frog came from two places. First, the name could have come from the first ever practice for the football team and they’re troubles dealing with horned frogs on the field. Second, the name could have come from a four student committee who subsequently plastered the horned frog image on the 1897 yearbook. Whatever story you believe, it was the Horned Frogs of AddRan College. AddRan changed its name to Texas Christian University in 1902. So it’s a case of the mascot showing up before the school. 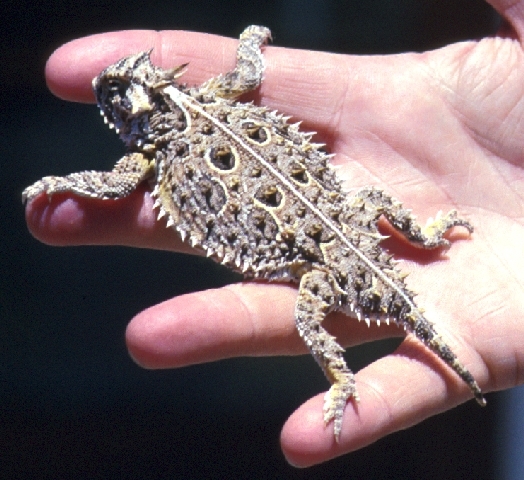 The horned frog itself is quite the biological wonder. It actually has what is dubbed as a “third eye” to help detect itself from danger. If there is danger and it’s either frightened or scared, the horned frog will shoot up to four fine streams of blood from its eyes. That’s right, its eyes. Now we have yet to see this on the field, but we hope it makes the SportsCenter Top 10 for night, heck for the week. The other distinguishing factor of the horned frog is, of course, it’s horns. They are prickly and sharp and can cause some slight abrasions if rubbed the wrong way. So it makes sense, whoever made to decision, to call the mascot the horned frog. But we didn’t see the costumed version until 1949. The Pep Club decided it was time to compete for mascot-dom and commissioned a new mascot to be named Addy the All-American Frog. While being named after the original name of the school, they decided to change it to more user friendly Super Frog in 1979. The outfit for Addy/Super Frog also took on other variations. He had big heads and small ones. He had fuzzy outfits and paper mache outfits. The current incarnation has fine fabric with uniforms. There’s so much more. 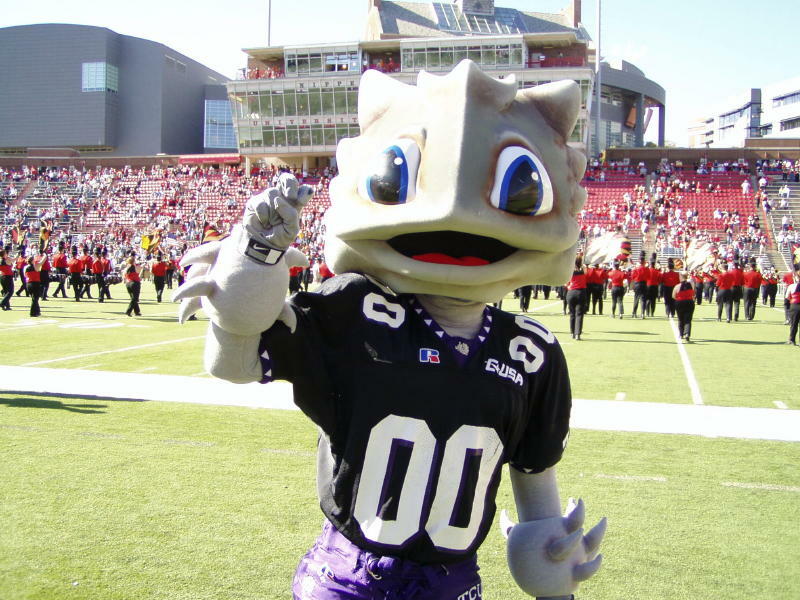 Super Frog wears the football gear over a gray colored jumpsuit. The legs and arms are decked out with horn attachments not unlike Shredder from the Teenage Mutant Ninja Turtles. The head is massive and there are many horns poking out from Super Frog’s noggin. Super Frog is fairly fearsome but they really need to lose the cartoon like eyes. The spike horns all over is a nice touch, but for an animal that shoots blood all over the cute eyes don’t fit. Still it’s a pretty tight mascot. That’s all you can really ask for in a mascot. Super Frog is crisp and direct. Anything else seems just too busy. From the incarnation back in the 1940’s through this spikey fellow today, Super Frog brings the pain and entertains while doing so. He doesn’t inspire that much fear but we hope one day he can shoot Super Soaker like streams of red Kool Aid from his eyes for the kids. Tasty indeed!